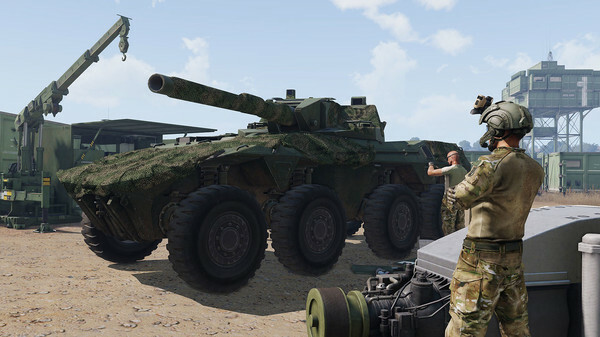 The experimental Linux beta of Arma 3 [Steam] has once again been updated putting the Linux version up to 1.82. This means the Linux beta is now compatible with the Tanks DLC, as well as being compatible with Windows gamers again until they get the 1.84 and we have to wait again. Currently, there's an issue in the Linux version where you can't see any servers in the server list. They're aware of the issue and suggest you view the server list in your browser and connect directly. You don't need to opt into any beta on Steam, as the Linux version will download without it just like any other game, it's just not advertised on Steam directly as it's still considered experimental. More info on why that is here. You can find all that's new in the 1.82 update here. oh man! yahoo! playing it currently on virOS. happy to switch to linux again!! exile mod rulez!!! It's a bit of a shame that 1.84 is just around the corner for Windows users. I'm willing to bet they release it next thursday, so if you want to play in a crowded multiplayer-environment, you better do it now while you can. Nice to see they keep updating the ports though. I hope it releases without the experimental tag one day. Quote Currently, there's an issue in the Linux version where you can't see any servers in the server list. They're aware of the issue and suggest you view the server list in your browser and connect directly. Just like info: Emp server + ArmaOnUnix steam group are ported community, feel free to join us any time, just few peoples but nice and friendly! Steppa Just like info: Emp server + ArmaOnUnix steam group are ported community, feel free to join us any time, just few peoples but nice and friendly! Also the server's IP is 92.52.6.237:2302 (since you can't use the server browser currently). I've heard before from someone at VP that Bohemia has one of the toughest QA processes they've ever seen which is why the updates are so far apart. It seems that the month-long QA process forgot about connecting to a server. At this point with how little the Linux ports are released, I couldn't care less about Arma 3. It's a shame too because if it wasn't for that I'd play it often and buy every DLC they make.